Very quickly after their marriage things changed at the Musk's butchers business. Their outlet in Tea Kettle Lane in Stetchworth became Musks the Butchers and within a few years Jim had opened in the nearby town of Newmarket. And they started to sell their own brand of sausages that were mixed with a secret range of spices. Elizabeth Musk mixed these in their Stetchworth farmhouse on her kitchen work-tops. These were then rushed to Newmarket and made into sausages. 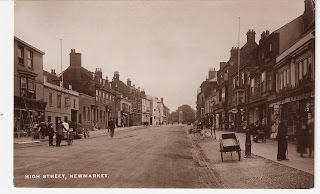 The reputation of these sausages spread and the Musks became very very successful, moving in 1905 their butchers shop to a prime location on Newmarket High Street (see picture right) where it remained until 1979 when it was finally forced to close. Jim's step-sons came into the business and Louis Frederick Drake ran it after Jim died in 1905. The big question that remains unanswered is who invented the recipe? Elizabeth, as a Drake, had been selling pork products in Stetchworth for some time. The sausages appear soon after their marriage. Was it really a Drake Sausage? Or did James bring the secret, perhaps from working in Chiswick? Probably we will never know.